Guante: hey you know what's awkward? 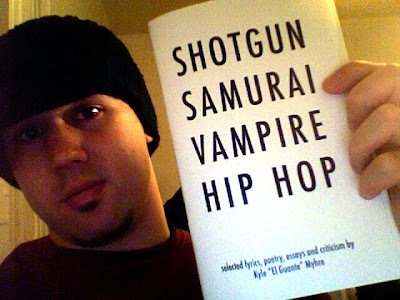 Going to Office Depot and asking the nice lady behind the desk to make a ridiculous amount of copies of a book entitled "SHOTGUN SAMURAI VAMPIRE HIP HOP." But hey, my book is done now. I think it turned out pretty good. Conceptually, it's more of a mixtape than an album, if that makes sense-- a collection of a bunch of my writing (song lyrics, poetry and essays) that's built up over the past few years. It's not exactly "Cane," but it's cool. Song lyrics make up the bulk of it, mostly from the new album, but a couple old songs and a couple songs that don't even exist as pieces of music yet. I ended up putting them in block/slash format rather than bar by bar in order to save space (and money, honestly). It would have been cool to have line breaks, but it still works out. 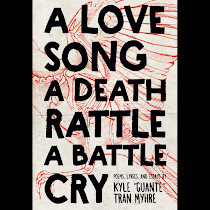 The poems and monologues are different-- some of them are included in paragraph format (which is how i write them), while others are broken up into proper stanzas. Some are really new and have never been heard/read before. On top of that stuff, i threw in a bunch of essays, writings on hip hop aesthetics, spoken-word culture, art and activism, and more. The book ended up at about 100 pages. Also also, there are a bunch of pictures of me in the book, which, upon further thought, is perhaps kind of weird. Haha. But hey, i wanted to put images in the book so it wasn't just all text but didn't have time to actually get visual art or anything else. Pictures of me will have to do. And they ARE nice pictures. Ended up going crazy at office max and springing an extra hundred bucks or whatever for spiral binding rather than staples (the one i'm holding in the above picture is a draft). So you people better BUY THE DAMN BOOK. I need the money. I'll be selling them at shows for next few months at least, probably longer. The 12/7 show in Madison will be an official "book release party," and i'm working on setting something up here in Minneapolis too.